I feel a close affinity with Balgo – or Wirrimanu as the current location of the community is properly called. I've been there three times, I've bought more art from there than from any other single centre – works by Old Mick Gill, Eubena, Matti Mudgedell, John Lee Jakamarra, Helicopter and Lucy. But most importantly of all, I was bitten by a dog there! This unhappy event happened while I was filming there, discussing our next move outside while the artists took their air-conditioned ease in the old wooden art centre. An ugly mutt sniffed unprotected white flesh, and took a chunk out of my shin. The artists poured out of the art centre as I was ushered back in – fortunately, they were intent only on kicking the dog. But when they returned, Eubena and another artist set to licking my wound! No one had ever done anything like that for me before! And I had no knowledge of Eubena's maparn/healer status. But, after initial shock, I realised just how comforting their generous act was. Later Tjumpo Tjapanangka took me off to the nurse for penicillin and a bandage; I felt totally restored by this two-way course of treatment. But the intimacy had another consequence – the inclusive nature of Aboriginal community life meant that I had to be given the skin name Tjapanangka, and a role in all their lives. And when I became Jeremy Eccles Tjapanangka, Tjumpo became my brother, Mati Mudgedell Napanangka, my sister – and I was given a strict list of women I couldn't marry! Later that memorable night, Mati sang the song of 'our' late father's spirit's journey to his birthplace on the Canning, while the sun set over the Wati Kutjarra Dreaming valley below us; and I couldn't have felt more at home. I later commissioned Mati to capture the memory of that experience on canvas. Sadly that was my last visit – and all my artists have died apart from John Lee and the indestructible Helicopter – as you can see from his two classic works here at Art Atrium. But Warlayirti the art centre goes on, resisting the view that the passing of the last of the old people born in the bush would be fatal to the future of the art's secret vitality, as my colleague Nicolas Rothwell is wont to suggest in The Australian. An elder like Bai Bai Napangarti has work here – half of one of the great artistic couples partnerships that were such a speciality at Balgo with the glorious Sunfly Nampitjin. Pauline and Melissa Sunfly are their painting inheritors – those confident black curves on Melissa's work here showing, I suspect a signature touch of her father. My sister Mati may be missing, but offspring Marie and Kuyarria travel the same Country with style. 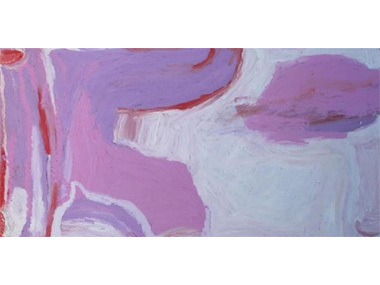 Nora Wompi also hangs in from her birth in the 1930s, bringing first contact and the direct experience of living mostly out in the desert at Well 33 – surly one of the great birthing sites for Australian artists – into her canvases. John Lee also says: “Everyone got involved because they love to paint that Dreaming – the Dreaming shared by all the tribes of the white Luurnpa Kingfisher”. Apart from wondering what any sensible Kingfisher was doing in the unlikely setting of the place where the Great Sandy and Tanami Deserts meet, it's worth considering two things about that statement: one – the mixture of five or six language groups in Balgo would not be a guarantee of harmony in the community without the art to give them common cause; and two – that Luurnpa might have given everyone a common songline, but it was actually the Catholic Pallottine Brothers who got people painting. They needed to celebrate Father Peile's silver jubilee at the Mission in 1981, so what better way to engage the locals than to get them to paint banners for St Theresa Church. This pair of four metre group works show little sign of Christianity – I think there's just one cross featured in what otherwise looks like Papunya map-making. And the colours are of that ilk too – acrylics mixed with ochres from the artists' country and then sung. It would take a visiting non-Indigenous artist, Warwick Nieass (working in the kitchens) to encourage the more daring colours and greater abstraction - “avant-garde, eclectic and explosive” is how the art was described when it first hit the wider world in 'Art from the Great Sandy Desert' at the WA Art Gallery in 1986. 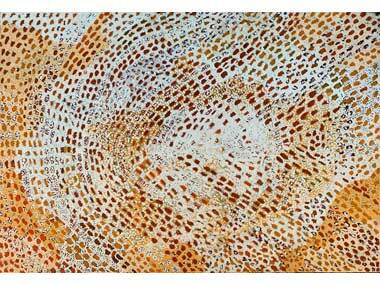 It's often forgotten that very few people were prepared to buy the early Papunya art in the 1970s and 80s. It was really only when the dynamism of Balgo and Yuendumu reached the market that it achieved any sort of momentum. “It was as if the ancestors had spoken through the market” is how academic Ian McLean puts it in the RMIT catalogue – overcoming the doubts of the more traditionalists who still felt it was wrong to reveal their culture to the uninitiated in this way. So is today's art ethnographic – and therefore not 'contemporary', as those who pray for an international market to take up the slack from a rather depressed local gallery scene are determined to brand it? What did the buyer of the grand Eubena at last weekend's Laverty sale think when they shelled out $25,000? Ian McLean would say they bought contemporary art. For he argues that art which speaks to the market speaks to our times, and therefore has to be contemporary. It's just the “failure of critics to understand the art's modernism let alone work out how to explain it as a post-conceptual political practice engaging the transcultural and transnational globalism of today's world”! I assume he's talking about academic critics rather than humble journos like me! I think you might find Dennis Scholl's arguments just a tad easier to follow! This relatively new American collector just opened an exhibition of nine male Aboriginal elders in Colorado, and it goes on to tour four more important 'contemporary' art museums across the States until mid-2016. He'd spent 25 years amassing a significant collection of non-Indigenous 'contemporary' art when he discovered (with a modicum of help from me!) 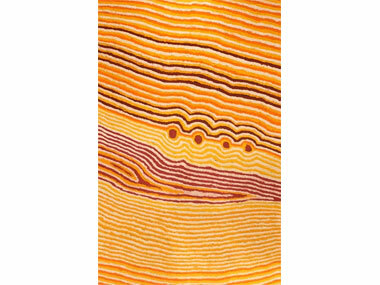 great Aboriginal painting. “It was clear it was some of the finest abstract painting the world has ever seen”, he writes in his catalogue, “transcending the ethnographic label that's been placed on it”. But having bought on the aesthetics of a canvas, “I then spent time trying to understand the combination of cosmology, spirituality and creation myth, along with the painter's deep relationship to the air and the land”. That's undoubtedly how to do it – even if you haven't got Mr Scholl's wherewithall to buy eight Tjumpo Tjapanangkas, seven Boxer Milners and seven Billy Thomas's (he was almost a Balgo man). Do note that – three of Scholl's nine selected artists are painting the same world that we see around us today.